Archaeological Report on Brutal 5th Century Swedish Massacre – Zero Equals Two! 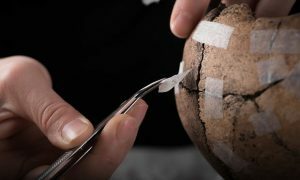 “Archaeologists in Sweden have uncovered startling evidence of a massacre more than 1500 years ago, when the inhabitants of a small village were struck down in their houses or as they fled along the street, and their bodies left to rot where they fell – with their treasures including beautiful jewellery and Roman gold coins. Read the whole sad story here: https://www.theguardian.com/science/2018/apr/25/swedish-archaeologists-uncover-brutal-5th-century-massacre.